The present research combines the areas of human resources management and humanistic psychology in order to propose a model of person-centered work systems that facilitate the emergence of the fully functioning person at work. The research questions of the study were as follows: i) What human resources practices constitute a person-centered work system? ii) What is the potential influence of person-centered work systems on the emergence of the fully functioning person? The study was developed in the context of knowledge workers in Mexican organizations. Utilizing a mixed methods approach, mainly through the use of interviews, evaluator component matching, and structural equation modelling, a model of person-centered work systems and the fully functioning person was developed. Moreover, a nomological validity test of the measures developed showed a full mediation effect of the fully functioning person on employees’ creative performance and a partial mediation effect between person-centered work systems and the employee outcomes of job satisfaction, affective commitment, diminished self-efficacy, dehumanization, emotional exhaustion, and organizational citizenship behavior. 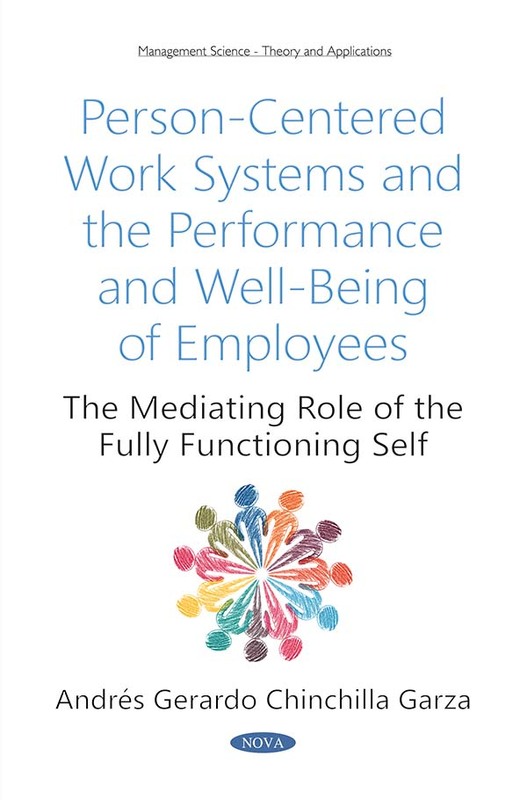 The findings of this research demonstrate the relevance of person-centered work systems and the fully functioning person for the achievement of both health- and work-related well-being, as well as additional important outcomes for the person at work. Alvesson, M., & Willmott, H. (1992). On the idea of emancipation in management and organization studies. Academy of Management Review, 17(3), 432-464. Appelbaum, E., Bailey, T., Berg, P. and Kalleberg, A. (2000). Manufacturing Advantage: Why High Performance Work Systems Pay Off. Ithaca, NY: Cornell University Press. Aryee, S., Walumbwa, F. O., Seidu, E. Y., & Otaye, L. E. (2016). Developing and leveraging human capital resource to promote service quality testing a theory of performance. Journal of Management, 42(2), 480-499. Bentler, P. M. (1990). Comparative fit indexes in structural models. Psychological Bulletin, 107, 238–246. Berg, B. L. (2001). Qualitative Research Methods for the Social Sciences. Needham Heights, MA: Pearson. Bollen, K. A. (1989). A new incremental fit index for general structural equation models. Sociological Methods and Research, 17, 303–316. Brockner, J., Ackerman, G., Greenberg, J., Gelfand, M. J., Francesco, A. M., Chen, Z. X., & Shapiro, D. (2001). Culture and procedural justice: The influence of power distance on reactions to voice. Journal of Experimental Social Psychology, 37(4), 300-315. Browne, M. W., & Cudeck, R. (1993). Alternative ways of assessing model fit. Sage focus editions, 154, 136-136. Cammann, C., Fichman, M., Jenkins, D., & Klesh, J. (1979). The Michigan organizational assessment questionnaire. University of Michigan, Ann Arbor. Carmines, E. G., & McIver, J. P. (1981). Analyzing models with unobserved variables: Analysis of covariance structures. Social measurement: Current issues, 65-115. Cartwright, D., DeBruin, J., & Berg, S. (1991). Some scales for assessing personality based on Carl Rogers’ theory: Further evidence of validity. Personality and Individual Differences, 12(2), 151-156. Cattell, R. (1978). The scientific use of factor analysis in behavioral and life sciences. New York, NY: Plenum. Chang, Y. Y. (2015). A multilevel examination of high-performance work systems and unit-level organisational ambidexterity. Human Resource Management Journal, 25(1), 79-101. Chang, S., Jia, L., Takeuchi, R., & Cai, Y. (2014). Do high-commitment work systems affect creativity? A multilevel combinational approach to employee creativity. Journal of Applied Psychology, 99(4), 665. Chuang, C. H., & Liao, H. U. I. (2010). Strategic human resource management in service context: Taking care of business by taking care of employees and customers. Personnel Psychology, 63(1), 153-196. Colquitt, J. A., & Zapata-Phelan, C. P. (2007). Trends in theory building and theory testing: A five-decade study of the Academy of Management Journal. Academy of Management Journal, 50(6), 1281-1303. Combs, A. W. (1962). Perceiving, behaving, becoming: A new focus for education. Washington, DC: National Education Association. Combs, J., Liu, Y., Hall, A., & Ketchen, D. (2006). How much do high‐performance work practices matter? A meta‐analysis of their effects on organizational performance. Personnel Psychology, 59(3), 501-528. Creswell, J. W. (2014). Research design: Qualitative, quantitative, and mixed methods approaches. Thousand Oaks, CA: Sage Publications. Creswell, J. W., & Plano Clark, V. L. (2007). Designing and conducting mixed methods research. Thousand Oaks, CA: Sage Publications. Dale, K. (2012). The employee as ‘dish of the day’: The ethics of the consuming/consumed self in human resource management. Journal of Business Ethics, 111(1), 13-24. DeJoy, D. M., Wilson, M. G., Vandenberg, R. J., McGrath-Higgins, A. L. and Griffin-Blake, C. S. (2010). Assessing the impact of health work organization intervention. Journal of Occupational and Organizational Psychology, 83, 139–165. Delbridge, R., & Keenoy, T. (2010). Beyond managerialism?. The International Journal of Human Resource Management, 21(6), 799-817. Denzin, N. K. (1978). The Research Act. Chicago: Aldine. Drucker, P. F. (1999). Knowledge-worker productivity: The biggest challenge. California Management Review, 41(2), 79-94. Dul, J., Ceylan, C., & Jaspers, F. (2011). Knowledge workers' creativity and the role of the physical work environment. Human Resource Management, 50(6), 715-734. Edmondson, A. C., & McManus, S. E. (2007). Methodological fit in management field research. Academy of Management Review, 32(4), 1246-1264. Efron, B. (1992). Bootstrap methods: another look at the jackknife. In Breakthroughs in Statistics (pp. 569-593). New York, NY: Springer. Elvira, M. M., & Davila, A. 2005. Emergent directions for human resource management research in Latin America. International Journal of Human Resource Management, 16, 2265-2282. Farrell, A. M. (2010). Insufficient discriminant validity: A comment on Bove, Pervan, Beatty, and Shiu (2009). Journal of Business Research, 63(3), 324-327. Fielding, N. G., & Fielding, J. L. (1986). Linking data (Vol. 4). Beverly Hills, CA: Sage. Fleming, P., & Sturdy, A. (2009). “Just be yourself!”: towards neonormative control in organizations?. Employee Relations, 31(6), 569-583. Flinchbaugh, C., Li, P., Luth, M. T., & Chadwick, C. (2016). Team‐level high involvement work practices: investigating the role of knowledge sharing and perspective taking. Human Resource Management Journal, 26(2), 134-150. Fornell, C., & Bookstein, F. L. (1982). Two structural equation models: LISREL and PLS applied to consumer exit-voice theory. Journal of Marketing Research, 19(4) 440-452. Fornell, C., & Larcker, D. F. (1981). Structural equation models with unobservable variables and measurement error: Algebra and statistics. Journal of Marketing Research, 18(3) 382-388. Francis, J. J., Johnston, M., Robertson, C., Glidewell, L., Entwistle, V., Eccles, M. P., & Grimshaw, J. M. (2010). What is an adequate sample size? Operationalising data saturation for theory-based interview studies. Psychology and Health, 25(10), 1229-1245. Gelade, G. A., & Ivery, M. (2003). The impact of human resource management and work climate on organizational performance. Personnel Psychology, 56(2), 383-404. George, J. M., & Zhou, J. (2002). Understanding when bad moods foster creativity and good ones don't: The role of context and clarity of feelings. Journal of Applied Psychology, 87(4), 687. Gittell, J. H., Seidner, R., & Wimbush, J. (2010). A relational model of how high-performance work systems work. Organization Science, 21(2), 490-506. Givaudan, M., & Pick, S. (1999). Psychology in Mexico. M. Alonso & A. Eagly. Glover, L., & Butler, P. (2012). High-performance work systems, partnership and the working lives of HR professionals. Human Resource Management Journal, 22(2), 199-215. Glynn, M. A. (2016, August 05). AOM 2016 Theme: Making Organizations Meaningful. Retrieved from http://aom.org/annual meeting/theme/. Goh, J., Pfeffer, J., Zenios, S. A., & Rajpal, S. (2015). Workplace stressors & health outcomes: Health policy for the workplace. Behavioral Science & Policy, 1(1), 43-52. Gordon, T. (1951). Group-centered leadership and administration. CR Rogers, Client-Centered Therapy. Boston, MA: Houghton Mifflin. Guest, D., Conway, N., & Dewe, P. (2004). Using sequential tree analysis to search for ‘bundles’ of HR practices. Human Resource Management Journal, 14(1), 79-96. Guest, D. E., Michie, J., Conway, N., & Sheehan, M. (2003). Human resource management and corporate performance in the UK. British Journal of Industrial Relations, 41(2), 291-314. Hartog, D. N., & Verburg, R. M. (2004). High performance work systems, organisational culture and firm effectiveness. Human Resource Management Journal, 14(1), 55-78. Innocenti, L., Profili, S., & Sammarra, A. (2013). Age as moderator in the relationship between HR development practices and employees’ positive attitudes. Personnel Review, 42(6), 724-744. Jackson, S. E., Schuler, R. S., & Jiang, K. (2014). An aspirational framework for strategic human resource management. Academy of Management Annals, 8(1), 1-56. James L. R., Mulaik S. A., & Brett J. M. (2006). A tale of two methods. Organizational Research Methods, 9, 233–244. Janssens, M., & Steyaert, C. (2009). HRM and performance: A plea for reflexivity in HRM studies. Journal of Management Studies, 46(1), 143-155. Jensen, J. M., Patel, P. C., & Messersmith, J. G. (2013). High-performance work systems and job control consequences for anxiety, role overload, and turnover intentions. Journal of Management, 39(6), 1699-1724. Jiang, K., Chuang, C. H., & Chiao, Y. C. (2015). Developing collective customer knowledge and service climate: The interaction between service-oriented high-performance work systems and service leadership. Journal of Applied Psychology, 100(4), 1089-1106. Jiang, J. Y., & Liu, C. W. (2015). High performance work systems and organizational effectiveness: The mediating role of social capital. Human Resource Management Review, 25(1), 126-137. Judge, T. A., Heller, D., & Mount, M. K. (2002). Five-factor model of personality and job satisfaction: A meta-analysis. Journal of Applied psychology, 87(3), 530-541. Kandemir, D., Yaprak, A., & Cavusgil, S. T. (2006). Alliance orientation: Conceptualization, measurement, and impact on market performance. Journal of the Academy of Marketing Science, 34(3), 324-340. Karpen, I. O., Bove, L. L., & Lukas, B. A. (2011). Linking service-dominant logic and strategic business practice: A conceptual model of a service-dominant orientation. Journal of Service Research, 15(1), 21-38. Karpen, I. O., Bove, L. L., Lukas, B. A., & Zyphur, M. J. (2015). Service-dominant orientation: Measurement and impact on performance outcomes. Journal of Retailing, 91(1), 89-108. Kaufman, S., & Vosburg, G. K. (1997). 'Paradoxical' Mood Effects on Creative Problem-solving. Cognition & Emotion, 11(2), 151-170. Keenoy, T. (1997). HRMism and the languages of re-presentation. Journal of Management Studies, 34(5), 825-841. Keenoy, T. (2011). Human resource management. In M. Alvesson, T. Bridgman, & H. Willmott (Eds. ), The Oxford Handbook of Critical Management Studies (454-472). New York, NY: Oxford University Press. King, B. J., & Pope, B. (1999). Creativity as a factor in psychological assessment and healthy psychological functioning: The assessment of psychological health: Optimism, creativity, playfulness and transitional relatedness. Journal of Personality Assessment, 72, 200–207. Kooij, D. T., Jansen, P. G., Dikkers, J. S., & De Lange, A. H. (2010). The influence of age on the associations between HR practices and both affective commitment and job satisfaction: A meta-analysis. Journal of Organizational Behavior, 31(8), 1111-1136.
and Projections. Notebooks of Dissemination of the National Institute of Investigation in Human Development, 3. Retrieved from http://www.inidh.org.mx/documentos/cuaderno3.pdf. LaRocco, J. M., House, J. S., & French Jr, J. R. (1980). Social support, occupational stress, and health. Journal of Health and Social Behavior, 202-218. Liao, H., & Chuang, A. (2004). A multilevel investigation of factors influencing employee service performance and customer outcomes. Academy of Management Journal, 47(1), 41-58. Liao, H., Toya, K., Lepak, D. P., & Hong, Y. (2009). Do they see eye to eye? Management and employee perspectives of high-performance work systems and influence processes on service quality. Journal of Applied Psychology, 94(2), 371-391. Lietaer, G. (2016). The research tradition in person-centered/experiential psychotherapy and counseling: bibliographical survey 1940–2015. Person-Centered & Experiential Psychotherapies, 1-31. MacKinnon D. P., Lockwood C. M., Hoffman J. M., West S. G., & Sheets V. (2002). A comparison of methods to test mediation and other intervening variables effects. Psychological Methods, 7, 83–104. Marchington, M., & Wilkinson, A. (2008). Human resource management at work London. Chartered Institute of Personnel and Development. Marsh, H. W., & Hocevar, D. (1985). Application of confirmatory factor analysis to the study of self-concept: First-and higher order factor models and their invariance across groups. Psychological Bulletin, 97(3), 562-582. McCranie, E. W., & Brandsma, J. M. (1988). Personality antecedents of burnout among middle-aged physicians. Behavioral Medicine, 14(1), 30-36. McNabb, R., & Whitfield, K. (2001). Job evaluation and high performance work practices: compatible or conflictual?. Journal of Management Studies, 38(2), 293-312. McNamara, C. (2009). General guidelines for conducting interviews. Retrieved May, 17, 2016, from http://managementhelp.org/business research/interviews.htm. Messersmith, J. G., Patel, P. C., Lepak, D. P., & Gould-Williams, J. S. (2011). Unlocking the black box: Exploring the link between high-performance work systems and performance. Journal of Applied Psychology, 96(6), 1105. Mirowsky, J., & Ross, C. E. (1984). Mexican culture and its emotional contradictions. Journal of Health and Social Behavior, 2-13. Moreno-Jiménez, B., Rodríguez-Carvajal, R., & Escobar Redonda, E. (2001). La evaluación del burnout profesional. Factorialización del MBI-GS. Un análisis preliminar. Ansiedad y Estrés, 7(1), 69-78. Nicholls-Nixon, C. L., Castilla, J. A. D., Garcia, J. S., & Pesquera, M. R. (2011). Latin America management research: Review, synthesis, and extension. Journal of Management, 37(4), 1178-1227. Organ, D. W., & Ryan, K. (1995). A meta‐analytic review of attitudinal and dispositional predictors of organizational citizenship behavior. Personnel Psychology, 48(4), 775-802. Patel, P. C., Messersmith, J. G., & Lepak, D. P. (2013). Walking the tightrope: An assessment of the relationship between high-performance work systems and organizational ambidexterity. Academy of Management Journal, 56(5), 1420-1442. Pfeffer, J. (2008). What were they thinking? : Unconventional wisdom about management. Harvard Business Press. Pfeffer, J. (2010). Building sustainable organizations: The human factor. Academy of Management Perspectives, 24, 34-45. Podsakoff, P. M., MacKenzie, S. B., & Bommer, W. H. (1996). Transformational leader behaviors and substitutes for leadership as determinants of employee satisfaction, commitment, trust, and organizational citizenship behaviors. Journal of Management, 22(2), 259-298. Posthuma, R. A., Campion, M. C., Masimova, M., & Campion, M. A. (2013). A high performance work practices taxonomy integrating the literature and directing future research. Journal of Management, 39(5), 1184-1220. Proctor, C., Tweed, R., & Morris, D. (2015). The Rogerian Fully Functioning Person: A Positive Psychology Perspective. Journal of Humanistic Psychology, 56(5), 503-529. Redman, T., & Snape, E. (2016). The consequences of dual and unilateral commitment to the organisation and union. Human Resource Management Journal, 26(1), 63-83. Richards, R. (2007). Everyday creativity and new views of human nature: Psychological, social, and spiritual perspectives. Washington, DC: American Psychological Association Press. Rogers, C. (1961). On becoming a person: A therapist view of psychotherapy. London: Constable. Rogers, C. (1963). The concept of the fully functioning person. Psychotherapy: Theory, Research & Practice, 1(1), 17-26. Rogers, C. (1977). On personal power: Inner strength and its revolutionary impact. New York: Constable. Rowley, J., Baregheh, A., & Sambrook, S. 2011. Towards and innovation-type-mapping tool. Management Decision, 49(1): 73-86. Russell, R. F., & Gregory Stone, A. (2002). A review of servant leadership attributes: Developing a practical model. Leadership & Organization Development Journal, 23(3), 145-157. Searle, R., Den Hartog, D. N., Weibel, A., Gillespie, N., Six, F., Hatzakis, T., & Skinner, D. (2011). Trust in the employer: The role of high-involvement work practices and procedural justice in European organizations. The International Journal of Human Resource Management, 22(05), 1069-1092. Schaufeli, W. B., & Bakker, A. B. (2004). Job demands, job resources, and their relationship with burnout and engagement: A multi-sample study. Journal of Organizational Behavior, 25(3), 293-315. Schneider, B., White, S. S., & Paul, M. C. (1998). Linking service climate and customer perceptions of service quality: Tests of a causal model. Journal of Applied Psychology, 83(2), 150-163. Scotti, D. J., Harmon, J., Behson, S. J., & Messina, D. J. (2007). Links among high-performance work environment, service quality, and customer satisfaction: An extension to the healthcare sector/practitioner application. Journal of Healthcare Management, 52(2), 109. Shin, D., & Konrad, A. M. (2014). Causality between high-performance work systems and organizational performance. Journal of Management. doi:0149206314544746. Steers, R. M. (1977). Antecedents and outcomes of organizational commitment. Administrative Science Quarterly, 46-56. Strahan, R., & Gerbasi, K. C. (1972). Short, homogeneous versions of the Marlowe-Crowne Social Desirability Scale. Journal of Clinical Psychology, 28(2), 191-193. Stirpe, L., & Zárraga-Oberty, C. (2016). Are high-performance work systems always a valuable retention tool? The roles of workforce feminization and flexible work arrangements. European Management Journal. 1-9. Su, C., Yang, Z., Zhuang, G., Zhou, N., & Dou, W. (2009). Interpersonal influence as an alternative channel communication behavior in emerging markets: The case of China. Journal of International Business Studies, 40(4), 668-689. Thompson, P. (2011). The trouble with HRM. Human Resource Management Journal, 21(4), 355-367. Townley, B. (2004). Managerial technologies, ethics and managing. Journal of Management Studies, 41(3), 425-445. Trullen, J., Stirpe, L., Bonache, J., & Valverde, M. (2016). The HR department's contribution to line managers' effective implementation of HR practices. Human Resource Management Journal. doi:10.1111/ 1748-8583.12116. Tzafrir, S. S. (2005). The relationship between trust, HRM practices and firm performance. The International Journal of Human Resource Management, 16(9), 1600-1622. Vargo, S. L. & Lusch, R. L. (2008). Service-dominant logic: Continuing the evolution. Journal of the Academy of Marketing Science, 36, 1-10. Van de Ven, A. H., & Poole, M. S. (2005). Explaining development and change in organizations. Academy of Management Review, 20, 510-540. Van De Voorde, K., & Beijer, S. (2015). The role of employee HR attributions in the relationship between high‐performance work systems and employee outcomes. Human Resource Management Journal, 25(1), 62-78. Van De Voorde, K., Paauwe, J., & Van Veldhoven, M. (2012). Employee well‐being and the HRM–organizational performance relationship: A review of quantitative studies. International Journal of Management Reviews, 14(4), 391-407. Van De Voorde, K., Van Veldhoven, M., & Peccei, R. (2016, June 22). Human resource management journal special issue call for papers. Exploring trade-offs between employee well-being and organizational performance: The role of human resource management. Retrieved from http://onlinelibrary.wiley.com/store/10.1111/(ISSN)1748-8583/asset/homepages/HRMJ_Special_Issue_CFP.pdf?v=1&s=cbe1bfc5a550affeb7d1b88e06b739a0204b1e12. Vinarski-Peretz, H., Binyamin, G., & Carmeli, A. (2011). Subjective relational experiences and employee innovative behaviors in the workplace. Journal of Vocational Behavior, 78, 290–304. Von Bertalanffy, L. (1968). General Systems Theory. New York. Way, S. A. (2002). High performance work systems and intermediate indicators of firm performance within the US small business sector. Journal of Management, 28(6), 765-785. Wu, N., Hoque, K., Bacon, N., Llusar, B., & Carlos, J. (2015). High-performance work systems and workplace performance in small, medium‐sized and large firms. Human Resource Management Journal, 25(4), 408-423. Yang, C. C., & Lin, C. Y. Y. (2009). Does intellectual capital mediate the relationship between HRM and organizational performance? Perspective of a healthcare industry in Taiwan. The International Journal of Human Resource Management, 20(9), 1965-1984. Zacher, H., Robinson, A. J., & Rosing, K. (2014). Ambidextrous leadership and employees' self-reported innovative performance: The role of exploration and exploitation behaviors. The Journal of Creative Behavior, 50(1), 24-46. Keywords: Person-centered approach, high-performance work systems, fully functioning person, well-being, creative performance, organizational citizenship behavior. Audience: Institutions and associations which might find the book useful: Humanistic Management Network, Association for the Development of the Person Centered Approach, Critical Management Organization, Society for Human Resource Management, American Human Resources Development Association, Association for Talent Development, “Asociación Mexicana en Dirección de Recursos Humanos”, Association for Human Resources Management in International Organizations, HR Policy Association, Federation of International Employers, the International Labour Office. Practitioners of human resources management in strategic positions such as: Human Resources (HR) Leaders, HR Managers, HR Directors, HR VPs, HR Specialists, HR Business Partners. Consultants in the areas of human resources management, organization development, organizational change, human potential development in organizations, and other related areas. Practitioners in the public policy arena specifically in areas of work relations policy. Academics in the areas of human resources management, organizational behavior, organizational development, organizational change, humanistic psychology, humanistic management.